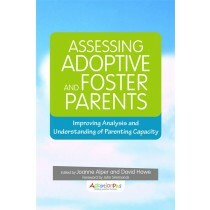 AdoptionPlus is proud to have a new book published by Jessica Kingsley Publishers titled ‘Assessing Adoptive and Foster Parents. Improving Analysis and Understanding of Parenting Capacity’. This has been edited by Joanne Alper and David Howe and is DDP influenced, including chapters from Dan Hughes, Jon Baylin, Kim Golding and Ben Gurney-Smith. More details about this book can be found in the DDP Resource Library.